Ashreicha. The sifrei Chabad are truly amazing- it's wonderful that you found your place in Torah. This was a great post (I actually read it twice). While I am not Lubavitch, I have a very strong tie on a neshmah level to them. What I liked about this post was that it was real. It's so true that sometimes we stray from the way we were brought up (or from the way that we were mekarved). Eventually we find what works for us and is a good fit. Chabakuk Elisha did just that. A large part of Chabad's success is isn't just with those that are start out non-observant, but with those that are frum, but looking for something more. Exactly! And I'm so glad that it resonated with you. Pardon my anonymous posting but i dont want this coming back to me. My parents were makarved by Chabad and have now been Lubavitch for almost 8 years. I myself followed suit later but was makarved in college by a polish chasid. Chassidus attracted me because not only does it focus on humbling ones self (like all Jews concepts; litvish, sephardic, yekish, etc) but Joy was the bigger picture. None of this sadness non stop tachnun. I could have become Lubavitch no problem. My parents are, my close friends are. Im kind of the odd chasid out. The reason why I didnt become more Lubavitch is being of the attitude that they are higher than all other Chassidic groups. That their Rebbes were the leaders of the generation and that anything not Chabad is less. I find that offensive and although I am very close to Lubavitch and learn Chabad Chassidus and daven in a Chabad shul that makes me sad. I get comments left and right "oh you are doing this wrong. 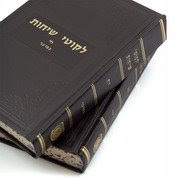 Most baal teshuvas through Chabad are not taught the difference between Halacha and Minhag. Ive kind of come to terms with it and am able to respond quickly back to them in a friendly way but I just dont like the arrogance of Chabad. Not to mention the whole Moshiach thing which makes me throw up in my mouth. Is that to imply that Chabad is the Moshe Rabbeniu of Chassidus? Chabakuk Elisha: Just read your beautiful post and wanted to say: Ashrecha v'tov lach! May Hashem help me and all of Klal Yisroel grow in Yiddishkeit -- A Kesiva Vchasima Tova, Leshana Tova Umesuka to all! VD"L is roshei teivos for vdai lmaivin. Which is to say if you understand what my comment means then good. And if not, well then you weren't the intended audience. I smiled as I read this again. Then smiled wider at my anonymous post about my parents being Lubavitch and my struggle with connecting to a specific derech of chassidus. Now im coming back to Lubavitch. This is going to be interesting.